Animal rights activists have filed a petition in Sri Lanka's Supreme Court to reverse the removal of two baby elephants from an elephant orphanage. The Sathwa Mithrayo rights group wants the court to revoke a government decision to hand the animals over to an important Buddhist temple. The government says there is a shortage of elephants for religious processions. 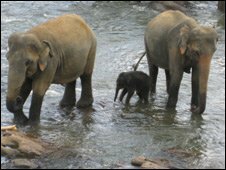 Environmentalists say that the elephants were taken from their mother while they were still suckling. "The mothers' udders have swollen because they're unable to give milk. It's not only the calves but even the mothers that are suffering," environmental lawyer Jagath Gunawardena told the AFP news agency. The animals were taken from the Pinnawela elephant orphanage in central Sri Lanka last week by officials and handed over to the Temple of the Tooth in Kandy. The court petition filed by the animal rights group says that baby elephants should live with their mothers for at least five years - and that the removal of the calves amounts to cruelty against them. Sathwa Mithrayo spokeswoman Sagarika Karaunananayake argues that the government's constitutional requirement to safeguard and develop Buddhism in the island should not be at the expense of rare wild animals. Sri Lankan cabinet minister Anura Priyadharshana Yapa earlier explained the reasons for handing them over to the temple. He said the temple, which is the headquarters for some prominent Buddhist monastic chapters, was the centre of a social, cultural and religious renaissance in Sri Lanka. "There is a severe shortage of tamed elephants which take part in religious processions," Mr Yapa is quoted by the government's information department as saying. "The ministry of sports and public recreation decided to gift two baby elephants from Pinnawela elephant orphanage for the purpose." 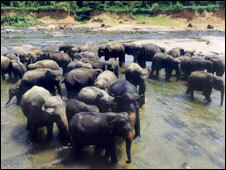 Elephants have long been associated with religious and traditional celebrations in Sri Lanka.